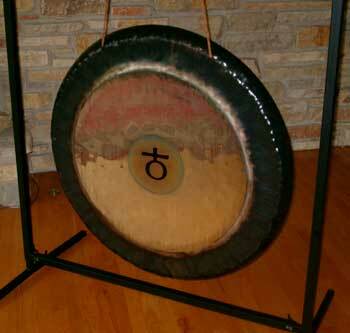 Sound, and it's accompanying vibrations, clear our energy field; serve as natural pain killers; and can facilitate physical, emotional, mental and spiritual transformation. Sound/vibration has been scientifically proven effective in treating many conditions including depression, cancer, stress, insomnia, ADHD, and more. This modality energizes through sound and intention by the use of patterned vibrational sounds from Tibetan Singing Bowls, Gongs, Tingshas, Ghantas, and other instruments. Sessions include energy balancing, grounding, chakra work, and more. This treatment enhances health and creativity, improves learning ability, enhances memory and attention, energizes our ability to take action, and stimulates the process of transformation. 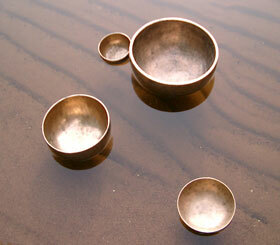 Sound healing also calms the mind and body, while contributing to a deep sense of well-being. During our waking state, the typical frequency of our brain waves is that of Beta. Sound tools entrain the brain to move into the deeper Alpha and Theta brain wave frequencies. These are the frequencies that induce deep meditative and peaceful states, clarity of mind, and intuition. Modern medicine can now measure and thus confirm the practice of sound as a means to heal—and vibrational sound from Tibetan Singing Bowls has such proven results. Mitchel Gaynor, MD is a clinical professor at Weill-Cornell Medical College and founder of Gaynor Integrative Oncology in New York City. The August 2003 issue of Spirituality and Health magazine reports the success he has had in treating victims of life-threatening disease and those undergoing chemotherapy and its side effects through sound therapy �?including Tibetan bowls, crystal bowls and chanting. What does the sound from these instruments actually do? The power of these instruments lies in their ability to delicately shift and align energy in an intentional manner. This assists the physical, emotional, mental, and spiritual energies in moving towards harmonious alignment. When these energies are aligned, the resulting body and/or chakra balancing makes us an ideal “environment�?for healing. The primary purpose of the Earth Gong and Tibetan Singing Bowls is to help all sentient beings align with our wholeness and experience our perfection �?and in doing so, align with the greater universe. When this happens, we bring this sense of ourselves to all aspects of our lives in a manner that dissolves the need for protection or the feeling that something is missing. These instruments bring us back to our wholeness again and again until we are confidently rooted in our being-ness. During a Tibetan Sacred Sound session the client lays, fully dressed, on a BioMat on the floor. 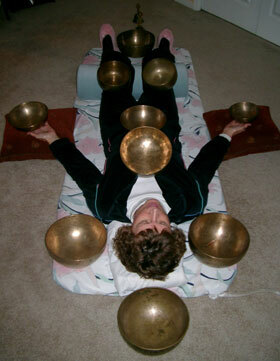 After Tingsha diagnostics are performed, the bowls are held above and placed on and/or around the client in various patterns, utilizing sacred geometry. Additional instruments, such as Ghantas (bells) may also be used, according to what is needed at the time. To prepare, ideally, the client wears natural fiber clothing (cotton, wool, linen, silk); avoids caffeine, alcohol, and non-prescription drugs; and only eats lightly that day. Just like getting ready for a therapeutic massage, one would NOT want to eat a large and/or heavy meal right beforehand. Each session costs $75 and includes 50 to 60 minutes of sound/vibration; entire sessions usually last approximately 1.5 hours.